Thermage in La Jolla is a non-invasive approach to transforming the appearance of saggy, crepe-like skin on the face and elsewhere on your body. The energy contained in radio frequency waves is used to heat the skin. The heat stimulates the production of collagen and tightens the skin. Popular among celebrities like Gwyneth Paltrow and Linda Evangelista, thermage in San Diego is affectionately referred to as “face ironing,” although the technology is more akin to that of a microwave oven. Is thermage La Jolla painful? According to Ms Paltrow, it tingled and felt a little bit like sunburn, but it gave her the results she wanted without having to “go under the knife.” Ms Evangelista likens the procedure to changing her makeup or hair color. At the SK Clinic in La Jolla, thermage softens lines and wrinkles and creates subtle, natural-looking results that produce an overall more youthful appearance in only one treatment. You go home with tightened, smoother skin with no injections, no surgery and no down time. • The face – Are phrases like, turkey neck, sagging skin and loose jowls beginning to creep into your vocabulary? 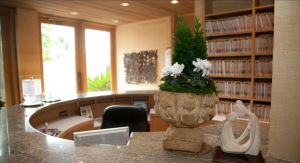 La Jolla thermage remodels collagen and smooths wrinkles and line for an overall youthful appearance. • The eyes – Do you always look like you’ve been up all night, even though you are getting a good night’s sleep? Our experts in thermage, near San Diego in La Jolla treat lower and upper eyelids to make you look younger and more rested. • The body – Got cellulite? Aging affects our entire bodies, not just the face. Dimples, bulges and saggy skin can pile on the years. Thermage in San Diego can reduce cellulite, at least for a while. Thermage La Jolla targets fine lines and wrinkles around the forehead, eyes and mouth. It can decrease hooding in the eye area and make it a lot easier to apply makeup. Loose jowls are tightened and the definition of the jawline is restored. Sagging under the chin is firmed up. Some experts say that optimum results are seen after six months, although people with sun-damaged skin or poor circulation may respond more slowly. In this case, a top-up treatment may speed things up. When is the best time to have thermage San Diego-style? Because you may not see immediate results, if you want to look great for that beach vacation or family wedding, you should plan to have your treatment a good five or six months before the big day.